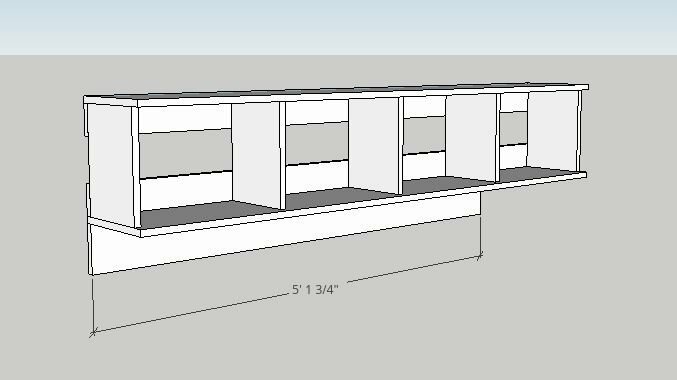 Hey all, it’s Tylynn dropping in from Bitterroot DIY with some free plans to build your own mudroom storage cubbies! It got cold fast here in Minnesota. I swear it was overnight and BAM! Winter. We had a sorta makeshift mudroom area in the basement right at the garage entrance, but it consisted of one shelf with hooks … that’s it … not much for a place that sees so much use and traffic. So I finally cracked down and built a whole new mudroom system last week. 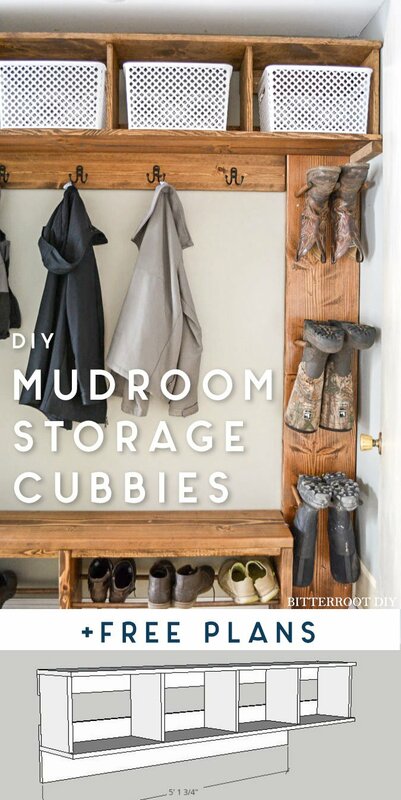 First things first – new mudroom storage cubbies! Enjoy these free plans! 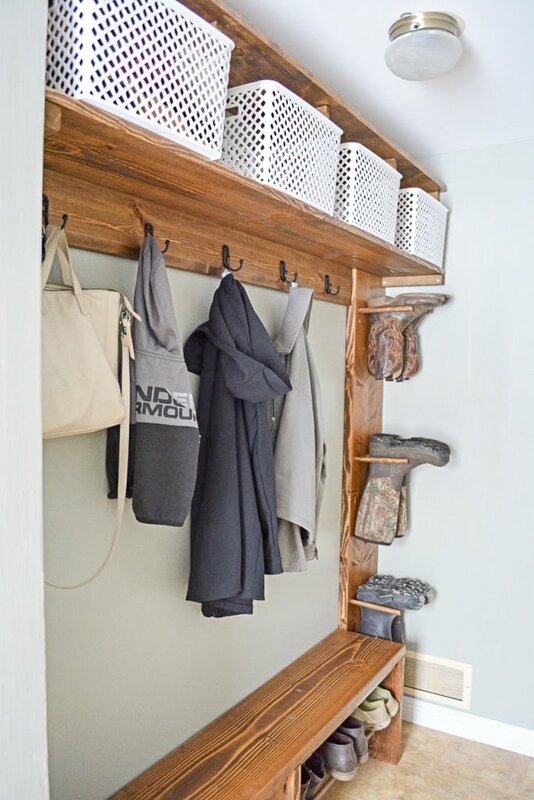 And don’t forget: you can find additional plans for the mudroom bench and boot hanger over at Bitterroot DIY to make this entire mudroom area! Attach the outside edge dividers to the top and bottom shelf with wood glue and 1 1/4″ pocket hole screws. Place two pocket hole screws on the top and two on the bottom for a secure joint. Position the dividers with 3/4″ gap at the back (for the back brace). 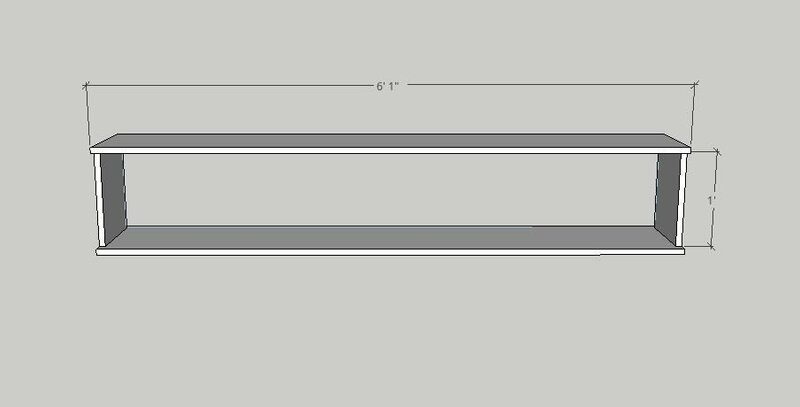 Since the dividers are 1 x 10s, this will leave a 1 1/4″ gap along the front. I put the pocket holes on the outside of the shelf since they’re hidden against the wall on both sides. Position the back braces flush along the back of the shelf and attach to the outside dividers with wood glue and 2″ self-tapping screws. Place two screws on each end of each brace for a secure joint. 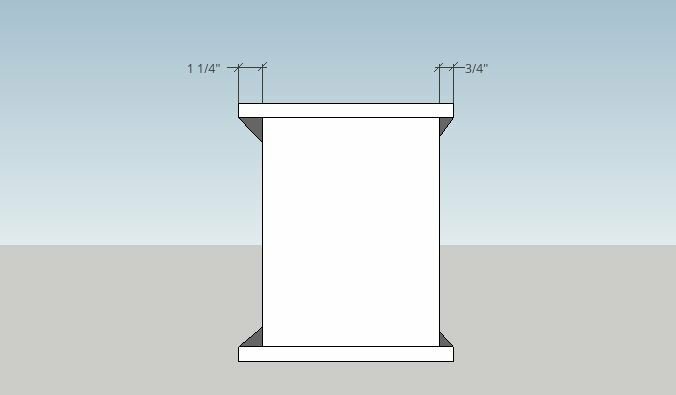 The back braces should be flush with the top and bottom shelf if you left a 3/4″ gap behind the 1 x 10 dividers. Insert the rest of the dividers. I attached them with wood glue and 2 1/2″ finish nails since the gap was too small to fit a drill. Once the dividers are in place, use 1 1/4″ self tapping screws to attach the back braces to each divider just like on the ends. Line the bottom hook shelf up with the left side and back of the bottom shelf. Attach with wood glue and 1 1/4″ pocket hole screws. Place pocket holes at the back to hide them when you attach the shelf to the wall. Sand and finish as desired. I finished this one with Varathane Weathered Wood Accelerator in brown and sealed it with Varathane triple-thick spray on polyurethane — my latest favorite combo! Position the shelf on the wall and attach it how you see fit. I placed ours with the bottom shelf at 6′ (resting on the boot rack) and screwed it directly into the studs along the back brace and end dividers. I also added two small cleats on each end just for good measure! Who knows how much weight this shelf might end up with once you get hats and gloves and coats and all the other random mudroom things on it … so I was extra careful. Please let me know if you have any questions and I’ll get back to you as soon as possible. 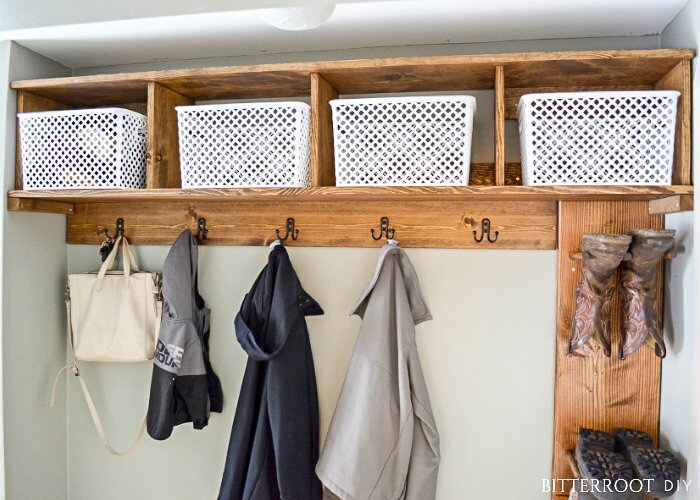 And don’t forget to grab plans for the mudroom bench and boot hanger to finish the space! For more project ideas like this, I’d love it if you stopped by my blog. You can also find me on Pinterest. And to stay up to date with the latest shenanigans, follow me on Instagram! Mudroom is awesome! I also love the white baskets. Where did you get those? 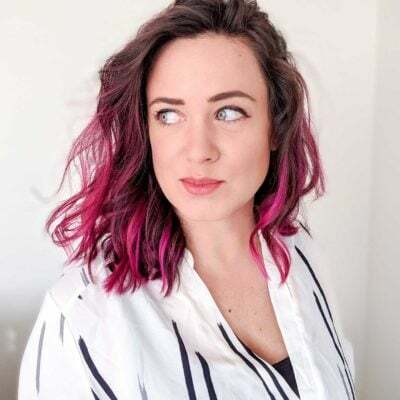 This is a post from one of my contributors (Tylynn), so you may get a faster answer if you head over to her blog at http://www.bitterrootdiy.com and ask there! 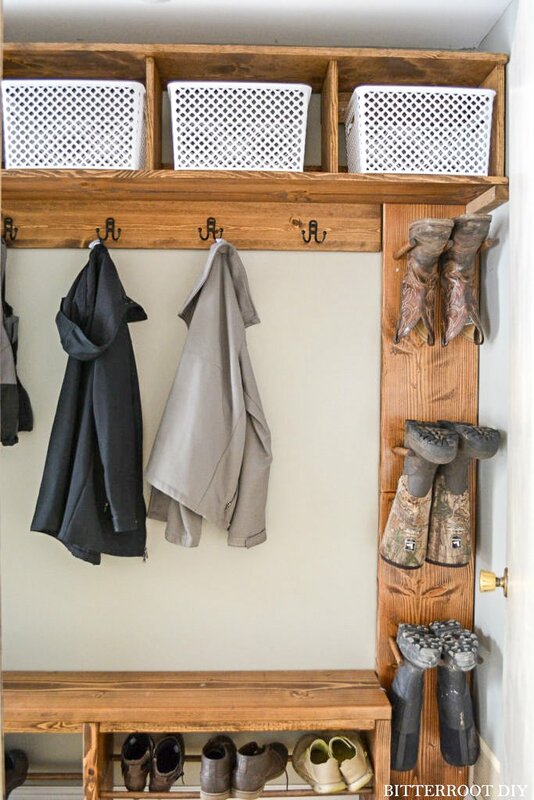 She also shares the details on the other two projects featured here (that storage bench and that awesome boot rack)!